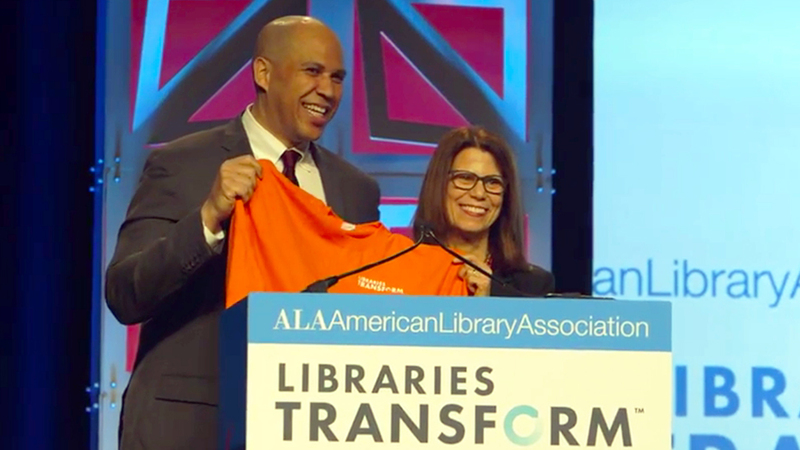 ALA President Sari Feldman presents Sen. Cory Booker a Libraries Transform t-shirt. 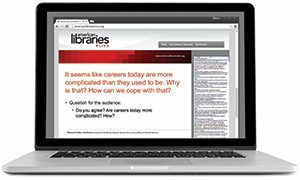 “Libraries are an essential bedrock of this democracy and ensure that we as a nation are who we say we are,” stated Senator Cory Booker (D-N. J.) 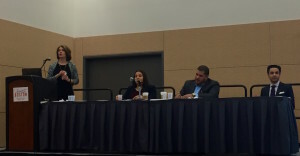 at the onset of the President’s Program at the 2016 ALA Midwinter Meeting & Exhibits in Boston on Sunday. 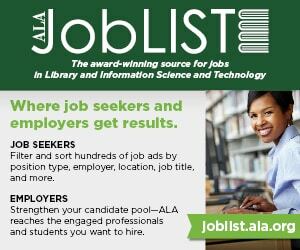 Feldman indicated that Booker’s appearance was an opportunity for the ALA to share with him how libraries transform individuals and communities, and the messages underlying ALA’s multiyear Libraries Transform public awareness campaign, which launched in October 2015. “Recasting the story is incredibly important to winning the support of national decision makers like Senator Booker,” said Feldman. Booker also spoke to the “caste system” that traps America’s marginalized populations, and shared personal experiences, including stories of the discrimination his parents faced in contrast to the privileges afforded to him, what it was like living in the Brick Towers low-income housing complex leading up to becoming mayor of Newark, and getting breakfast with civil rights activist Rep. John Lewis (D-Ga.) the day of his Senate swearing-in ceremony. Following the program, Booker took inquiries from the audience. “This is a no-holds-barred session,” he said, joking that if he was asked “Why are you still single?” he would assume his mother was behind that question. Booker answered questions related to incarceration and recidivism, infrastructure, and decriminalization of marijuana, as well as less serious questions about how he stays “graceful” on social media, his recent switch to veganism, and how he liked the new Star Wars movie. 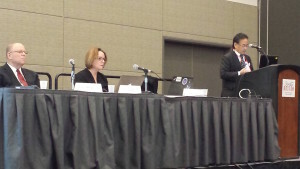 Booker doled out “virtual hugs” to the audience for being thoughtful and incisive. When asked about the defunding of libraries in Newark under his tenure, Booker again addressed the topic. 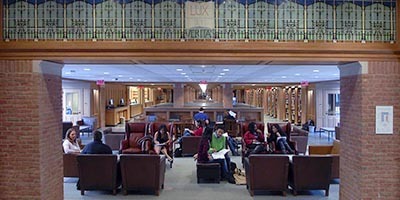 “Libraries are tragically defunded in Newark, under my leadership as well as previous and current leadership,” he said. “I’m for technology grants to public libraries because libraries are the great equalizer when it comes to access to technology,” Booker said, which was met with applause.